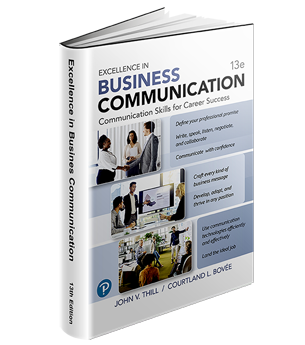 Teaching Business Communication is packed with a wealth of new ideas you can use to add value to your course and make it more instructive. Business Writing Blog for Business Writing Instructors will always keep instructors current and ready for class. Discover the latest tips and techniques that will keep you sharp and on the cutting edge. The first authors in the field to write an instructor blog, Bovée and Thill share instructional insights, offer advice on incorporating digital media, social media, mobile communication, and other technologies into the course, and provide compelling examples of good and bad business communication. Bovée says, "As instructors grapple with large class sizes and heavy advising loads, we are constantly on the lookout for ways that we can assist. By sharing best practices and offering innovative ideas and resources, we can help instructors spend less time preparing lectures and activities and more time teaching and working one-on-one with their students." Adds Thill, "Our textbooks are used in dozens of countries. This blog gives us a way to share new ideas quickly with business communication instructors throughout the world." With its focus on all original content, this blog complements the authors' existing website, Business Communication Headline News (a media curation service in which the authors hand-pick the best business communication articles and resources from across the Internet at http://businesscommunicationheadlinenews.com), and their unique online content-updating service for instructors and students, Bovée & Thill's Real-Time Updates (http://real-timeupdates.com). You'll appreciate the abundance of valuable teaching resources for your classes that Bovee and Thill provide. Visit these websites and take advantage of the wonderful classroom resources: Google+, Reddit, YouTube, LinkedIn, Facebook, and Twitter. To order an examination copy of a Bovee & Thill textbook, visit this page. An analysis of digital, social, and mobile media in business communication textbooks reveals Bovée and Thill’s superb coverage far exceeds the coverage found in competing texts, which in comparison is shockingly incomplete and out of date. Read the full article from ABC 6 News. A new video shows the surprising differences among textbooks authored by Courtland Bovee and John Thill, and their competitors. For example, only Bovee and Thill offer groundbreaking coverage of mobile communication. This is critical because students live in a mobile world–and they’re about to enter a workplace where mobile has gone mainstream–so any business communication course that aims to stay relevant must incorporate mobile. Bovee and Thill also prepare students with the knowledge and skills they will be expected to have when they enter tomorrow’s workplace. The authors write the only texts that explain the new social communication model that is revolutionizing the way businesses communicate. Courtland Bovee says, “We offer a clear, consistent, and integrated approach to teaching writing using the three­-step process.” The three-­step process is uniformly applied throughout each book and is adapted to each message form. Read the full article from NBC Right Now. Ideas for teaching business writing are abundant in Bovee and Thill’s Business Communication Blog. Instructional techniques and approaches have taken on new dimensions due to the abundance of new topics now covered in the course, including digital communication, social media, and mobile communication. Bovee and Thill were the first authors to cover these topics in their textbooks, and they have a wealth of ideas to share with their readers on a regular basis about these topics, and many more. The blog offers origial articles that help instructors focus their teaching to help students learn more efficiently and effective. Articles discuss a wide variety of subjects, including new topics instructors should be teaching their students, resources instructors can use in their classes, solutions to common teaching challenges, and great examples of activities instructors can use in class. This blog will help instructors keep current with the latest information and trends in the field. It will help with the updating of lecture notes with fresh material. Instructors will be able to enhance their research projects with the newest data. They'll be able to compare best practices from other instructors. Today's students are holding the future of business communication in their hands. As another disruptive technology redefines business communication, Bovee and Thill are once again the first to respond with current, comprehensive, and fully integrated coverage. Just as Bovee and Thill pioneered coverage of the social media revolution, they now lead the market with up-to-the-minute coverage of mobile business communication. As with social media, the changes brought about by mobile run far deeper than the technology itself. Successful communication on mobile devices requires a new approach to planning, writing, and designing messages. With in-depth, integrated coverage of the challenges and opportunities that mobile presents, their books help students adapt their personal use of mobile devices to the unique demands of business communication. Through a variety of annotated model messages, questions, activities, and cases, students will gain valuable skills in the art of communicating via mobile devices. Here's a brief outline of their coverage of mobile business communication. To order examination copies of Bovee and Thill textbooks, visit this page. 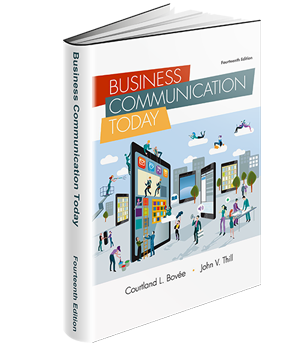 As you examine business communication textbooks, keep in mind that only Bovee and Thill cover mobile communication. Would you like to read more about this topic? 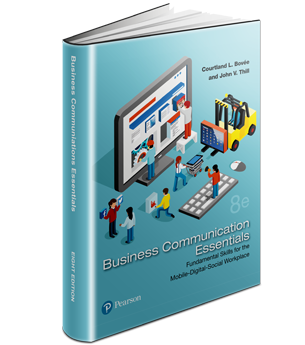 Which Business Communication Textbook Is the Best for Your and Your Students? Which Business Communication Textbook Is the Best? A textbook by Bovee and Thill. Why? Bovee and Thill were the first authors to cover digital communication, the first to cover social media, and now the first to cover mobile communication. Bovee and Thill are also recognized as having better coverage of technology than any other textbooks. While they cover approximately 84 technologies, most textbooks cover less than 30. They're clearly the most cutting-edge authors in the field. Importantly, Bovee and Thill's texts sell in greater volume than texts by any other others. Why settle for less? Go with the leaders, Bovee and Thill. Market-leading innovation. The unique new coverage of mobile communication in this edition is just one example of how for more than three decades, Bovée and Thill texts have pioneered coverage of emerging trends and their implications for business communication. They were the first authors in the field to give in-depth coverage to digital media, then social media, and now mobile communication. Up-to-date coverage that reflects today’s business communication practices and employer expectations. Technology, globalization, and other forces have dramatically changed the practice of business communication in recent years, even to the point of altering how people read and how messages should be constructed. To prepare students for today’s workplace, the business communication course needs to address contemporary skills, issues, and concepts. Practical advice informed by deep experience. Beyond the research and presentation of new ideas and tools, Bovée and Thill are among the most active and widely followed users of social media in the entire field of business communication. They don’t just write about new concepts; they have years of hands-on experience with social media, blogging, content curation, search technologies, and other important tools. They are active participants in more than 45 social media sites. Engaging coverage of real companies and contemporary issues in business communication. Bovée and Thill texts emphasize companies and issues students already know about or are likely to find intriguing. For example, cases in recent editions have addressed location-based social networking (the business communication implications of the FourSquare game app), employer restrictions on social media, and the use of Twitter in the job search process. Integrated learning. In sharp contrast to texts that tack on coverage of social media and other new topics, Bovée and Thill continually revise their coverage to fully integrate the skills and issues that are important in today’s workplace. This integration is carried through chapter-opening vignettes, chapter content, model documents, end-of-chapter questions, communication cases, and test banks to make sure students practice the skills they’ll need, not just read about them in some anecdotal fashion. For a wealth of material you'll find useful for teaching a course in business communication, we suggest you review these websites: Google+, Reddit, YouTube, LinkedIn, Facebook, and Twitter. Refer this video to friends. Technical writing is a highly valuable skill. It is crucial for anyone working in a tech-related business, for engineers and scientists communicating their knowledge, and for people looking for rewarding, full-time work as writers. Quick Switch helps you identify the best Bovée & Thill textbook for your business communication course, and then quickly build your syllabus and lesson plans with our first-of-its-kind system. How Does Your Text Compare? See how this book’s topic coverage compares to the competition. See how this book’s features compare to the competition. Have You Prepared Your Business Communication Students for a Mobile Job Search? Can Your Students Write Professionally for Mobile Audiences? Copyright © 2018-2019 by St. Evangelista Inc. All rights reserved.